STILLWATER, MN--(Marketwired - Jun 7, 2016) - When caterers, event and wedding planners, and sustainability managers consider options for compostable party and catering ware, available products do not give them much choice. Typical compostable products are eco-friendly, but disposable in design and throwaway in quality. Imagine going green for landfill-free events without sacrificing style, versatility or quality. That remarkable alternative is now available. SelfEco announced its new line of bioplastic party and catering ware that is Compostable without Compromise™. "Compostable products should be superior to the non-recyclable, disposable products they replace. You should not have to make sacrifices to use them. You should feel proud and excited to use them," said Danny Mishek, president, SelfEco. "We have transformed compostable party and catering ware from products customers are forced to use to products they want to use because of their quality and appeal." "SelfEco has created a line of upscale, attractive and durable disposable service ware that fits great into many event and party themes," said Connie Weigel, director of purchasing, Kelber Catering, Minneapolis, Minn. "It is all compostable and perfectly supports our sustainable hospitality practices." SelfEco designs, engineers, manufactures, and packages all its own party and catering ware in the U.S.A. with a biocompostable material sourced in the U.S.A. All SelfEco products are manufactured in a food-grade, food-safe biopolymer, a plant-based bioplastic (PLA) derived from starchy renewable plants. SelfEco uses PLA Ingeo™ Bioplastic from Natureworks, LLC. SelfEco products are certified compostable by the Biodegradable Products Institute (BPI). 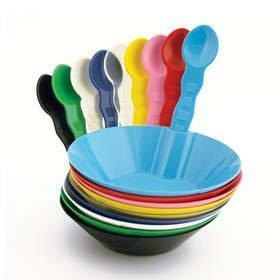 Compostable party and catering ware from SelfEco is trendy, tasteful, imaginative, colorful, fun, and well made. We design, engineer, manufacture, and package all our own biopolymer products, from champagne flutes to colorful cutlery, at our family-owned manufacturing facility in Stillwater, Minnesota. Third-generation manufacturers with expertise in design, engineering and fabrication bring you compostable products that are simply superior. All our food-grade, plant-based bioplastic (PLA) drinkware, caterware and cutlery are BPI-certified. With 12 fashion-forward colors, SelfEco style complements event themes and enhances food presentation. To see the advantages of party and catering ware that are Compostable without Compromise™, start at our website, www.selfeco.com.